When I was little, I wanted to be a ballerina/astronaut/archaeologist (yes, all three). This was a bit tricky because I never took ballet lessons. Turns out rocket science really ain’t my thing either. Archaeology was also no-go because dust and I don’t get on. Mindset Training was obviously nowhere on the horizon. So I became “a WRITER, darling”. The plan was to write gorgeous novels and make $$$ millions turning them into screenplays. But a girl’s gotta eat. The only millions in my life were the endless number of words I hurled out over the next 20 years, writing business and marketing communication material for lawyers, accountants and bankers. It didn’t light me up one little bit. In fact, I was dimming. The stations on my internal timeline were going dark, one by one. At least once a year, when the urge to murder someone became too insistent, I’d run away and scribble for a few months. It almost worked. I won a few competitions, sold the odd screenplay option and even landed a literary agent or two. But the success and $$$ millions never quite materialised before I ran out of money so off I’d trudge, back to the world of business change comms, dying a little more each time. I was living Groundhog Day over and over again. Fast forward to my fulfilling life today in Mindset Training. It seems such a huge leap. How did I get here? Through all those years in the wilderness, there was a big chunk of something missing. Sure, I had my creative writing sabbaticals, but even they didn’t fill the gap. Digging down, I discovered that what was missing was value. Because I wan’t making a damn bit of difference to anyone. There was no legacy in what I was doing. I wasn’t improving anything. I wasn’t helping anyone. I wasn’t delivering real, lasting value – and I certainly wasn’t receiving it. My road led not to Damascus but to the London College of Cognitive Therapies where, just a few months later, I began training as a Cognitive Behavioural Hypnotherapist. EUREKA! From day one I knew I’d found my true north. Why the heck didn’t everyone know about this?! Why were we being taught history dates and quadratic equations in school when we should have been learning how to THINK?! Why was it that only severely depressed, anxious, obsessive-compulsive or anorexic people had access to this powerful mindset stuff (via therapy)?! How could I help to spread the word that developing a self-aware, solution-focused mindset is the answer to so many of our problems?! I knew early on that I didn’t want to be a therapist – there are others who are so much better at that. My calling was to work with high-potential people who feel STUCK; extraordinary people who are capable of changing the world but aren’t doing it because their limiting beliefs, self doubt and procrastination are getting in the way. There wasn’t a job with that description, so I called myself a Mindset Trainer and made it up. Now, every day, I get to work with intelligent, passionate, high-potential women and men who’ve had enough of feeling stuck and want to stop sabotaging themselves and get cracking on doing their magnificent thing. This delivers (in truckloads) the value that has been missing from my life. By giving my clients MY value, I receive it back ten-fold in terms of satisfaction, excitement and the privilege of watching them shrug off their mind-shackles and embrace their full promise. Who do I deliver my Mindset Training value to? My absolute favourite clients are entrepreneurial women aged 35 and up. Women who, like me, feel instinctively that they are capable of more: More happiness. Better health. Deeper fulfilment. Stronger relationships. Bigger impact. Greater wealth in every sense. They know deep down that they have the capability within them, but they’re stuck. They feel overwhelmed, confused and not good enough. Ladies, you are my tribe. I love showing you how to release yourself from self-sabotage. And I love watching what you then go on to BE and DO with your beautiful new mindset. Sometimes, when my clients have liberated themselves from their own mind-blocks, they send their husbands to me. The Mindset Training process works splendidly for them too. I’m also drawn more and more to work with entrepreneurial leaders – women and men – in the kind of businesses I served as a communications consultant: legal and accountancy firms, business information companies and financial organisations. There are partners, directors and managers who crave less stress and more value, more enjoyment, more success. Who better to train them than someone who understands the pressures and opportunities of working in those businesses? I provide talks, workshops and 1-2-1 Mindset Training for organisations. If you’re hungry for the benefits of learning to think in a flexible, rational, solution-focused way, I have plenty of tips and techniques you can try. Start by downloading my free “PACES Guide to Why You Procrastinate”. I’ll follow that up with regular mindset tips and news. PS – I still love writing and telling stories. My book, “STUCK? How to Free Yourself of Fear, Self Doubt and Fixed Mindset” will be published in 2017. 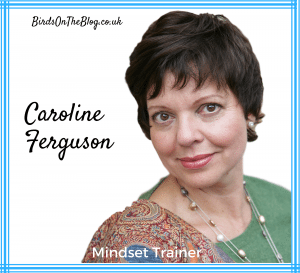 Caroline is a cognitive behavioural hypnotherapist and Mindset Trainer. The right Mindset turns promise into power and makes the difference between who you are and who you could be. Caroline helps potential game-changers beat the limiting beliefs and unhelpful habits that stop them from living a life that matters. Is that you? If so, do get in touch. Should we be offended by Louis Smith?